1) The Future’s So Bright: Don’t be put off by the head honcho who prances around the office in $400 sunglasses. While we often interpret the wearing of shades indoors as a sign that a douche is in our midst, it may well mean that a lycanthrope is signing your monthly pay check. Werewolves are known to be acutely photosensitive. 2) Anger Junkie: Unprovoked episodes of rage are an office classic. The conventional wisdom is that such behavior is the hallmark of the worst bosses, the ones who are suffering from power poisoning. However, werewolves also get angry. The change from human to hairy mutant is excruciating; the body bends and twists and muscles swell. Sound crazy? Answer this: whenever your department’s top gun goes loco, does he/she stay in the office? 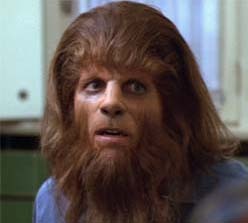 Of course not: once the transformation is complete, the last thing on a werewolf’s mind is the monthly budget report. It’s feasting time! 3) The Walls Have Ears: Are you amazed by the grand pooh-bah’s uncanny ability to catch you just as you’re ranting to colleagues about his/her frequent, unannounced and unexplained ‘business’ trips to faraway, exotic locations? Well, consider this: in the hours before they morph, werewolves develop acute hearing. 4) A Whiter Shade of Pale: Is the king of your cubicle jungle frequently pasty-faced? If so, do you simply assume that this is a testament to the bland regularity and incredible dullness of working in an open plan space that’s lit by those cold, harsh fluorescent lights? Could well be, but please keep in mind that werewolves lead exhausting lives and they tend to turn chalky the day after a full moon. 5) 99 44/100% Pure: Is your workspace overseer constantly washing his/her hands? While the consensus diagnosis around the water cooler is Obsessive-Compulsive Disorder, it’s worth noting that werewolves too are attentive to their hygiene. Indeed, they enjoy bathing in lakes and rivers and chew certain plants to improvise a dressing for wounds received while taking down large mammals like elk.